This is a two-year residential postgraduate programme spanned over four different semesters including village fieldwork, development internship, and management traineeship. First three semesters include classroom teaching focusing on concepts, skills, and knowledge pertaining to rural development and management, using modern pedagogical techniques. In the fourth Semester students will be concentrating on experiential learning, village fieldwork segment which will expose them to the realities of rural life. The development internship segment will help students understand the nature of organizational dynamics. The management traineeship segment will offer students an opportunity to apply, test, and sharpen the skills learnt in the classroom. About 30% of the total duration of the programme will be devoted to experiential learning and practical application of the knowledge and skills acquired. The faculty will be involved in the design and supervision of all field-based assignments. The MBA (RM) will provide an extensive understanding of the rural context, communities, markets and opportunities, knowledge and skills to understand analyze and address complex problems in rural markets; develop and implement livelihood programme and social change strategies and also design to incubate and nurture social enterprises. Students will learn to analyze managerial and developmental problems and develop insight, practical and innovative solutions to suit the requirement of rural mass. The MBA (RM) will prepare professionals to understand and serve rural communities, their organizations and other organizations engaged in promoting their welfare and income generating activities. This will be achieved through unique, mission-oriented management education, training, research and action. Traditionally, industry has been the main focus of management. The basic objective of introducing MBA (RM) course is to imbibe professionalism in the field of rural economy. The course is designed to address the following objectives- blending the managerial knowledge and practices of people with modern management science and techniques. Building and strengthening people’s organizations; Knowledge and skill needed for effective utilization and management of human and valuable resources. Application of technology to analyse factors influencing rural realities and generating an interface between the corporate sector and social development. The programme is designed to understand the rural economy and to create managers who have the knowledge of business management and the ability to work in the rural sector. The programme is prepared to make it more interactive, whether it is the interaction between the peers, rural society or the industry involved in the rural business. The programme is designed to imbibe the aspects of rigorous management education and also the bent of mind to work in the rural sector. During the summer training, students will undergo rigorous training of a minimum of eight weeks where the students will get an opportunity to understand the working environment of an organization and gain practical experience. It will strive to equip the students with more effective techniques and better decision making abilities. It will expose them to the real life applications of the development and management concepts learnt in the classroom. It will also help them to come up with innovative and target-oriented solutions to the major issues faced by the rural organizations. Another aspect that the students will learn during their summer internship is to address the operational and functional problems pertaining to the organizations. Rural living and Learning Experience will be significant part of a rural manager’s training and provides an opportunity to tune their qualities and capabilities. The University strongly believes that the students first and foremost cultivate the culture of re-learning and re-learning so that they can better adapt to the constant changes both in the industry as well as the society. The best way to provide this process is to help the students live with the rural people. As part of rural living the students will spend 45 days in the rural areas in India understanding the people and also simultaneously undertake a project. This will give them a firsthand experience of working professionally. Ultimately this rural stay enables the students to develop alternative perspectives and paradigms to develop and become better managers. This distinct component of the curriculum keeps students anchored to reality and at the same time prepares them for a world outside the institution. This segment will expose the students to the theories and concepts of basic management disciplines, specific requirements for understanding the issues of rural development as well as new and emerging areas in the broad spectrum of rural management. The students are often required to carry out micro research projects in selected villages and different organizational environments which will strengthen the ability of the students to design systems that can make practical connections between the local, regional and global realities and plan innovative interventions in rural areas. The core course will cover Accounting for Decision Making, Financial Management, Human Resource Management, Marketing, Management Information System, Managerial Analysis, Managerial Computing, Managerial Economics, Micro Planning, Operation Management, Organizational Communication, Quantitative Methods, Rural and Inclusive Marketing, Rural Development Administration, Rural production and Livelihood Systems, Social Research Methods, Strategies Management. Elective Courses will cover Advance Methods of Data Analysis, Agriculture Input Marketing, Agriculture Output and Food Marketing, Commercial Banking for Rural Management, Disaster Management, ICT & E-Governance for Development, Insurance and Risk Management, Marketing Research, Micro Finance Management, Project Monitoring and Evaluation, Rural Marketing Communication, Sales and Distribution Management, Supply Chain Management. This is the core requirement in which eminent speakers from the rural management will discuss the rural development, issues and future directions. Students will discuss the ethics, responsibilities and dilemmas of a development management process and learn to make proper decisions and leadership quality. Normally, the workload of a students will not exceed 18 credits in any semester or as decided by the Academic Council of the University. In other words, the workload will be limited to 18 credits in each semester. Credit for field and seminar components may be in addition to this. The students will be expected to study for a minimum of 60-70 hours in a week in preparation for the rigors of the management professionals. The curricular load will be designed to allow time to be spent in co-curricular and extra-curricular activities which lead to the overall development of the students. The MBA (RM) consists of 59 credits hrs distributed across classroom-based course (both core & elective), compulsory fieldwork and compulsory seminar/colloquium components. The curriculum and distribution of courses across components will be decided by the Academic Council of the University. Most of the courses carry 2 to 3 credits, with a few exceptions; special components such as the rural living and learning experience segments may have 10 credits. 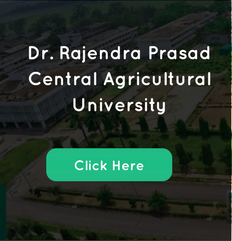 Details of the academic, evaluation pattern, examination, qualifying parameters and other related matters has been followed by ICAR/University guidelines. The RPCAU, Pusa will award the MBA (Rural Management) degree to the students who will successfully complete all the entire requirements for the award of degree. The degree will be awarded to successful students in the annual convocation. There will be 30 seats in MBA (RM) programme. Seats will be allocated as per the reservation policy of Govt. of India.